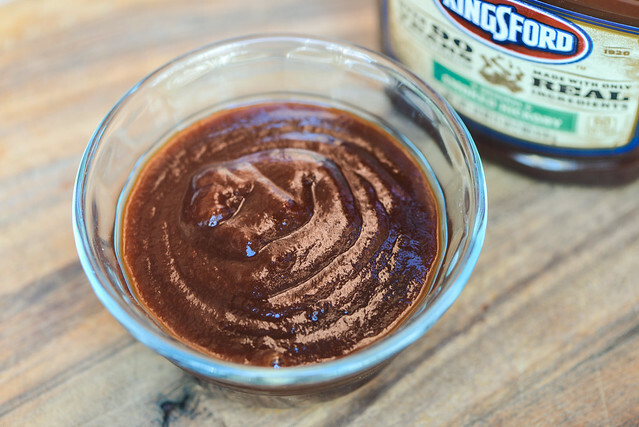 Bold flavors with a strong smokiness puts this Kingsford product in the family of common supermarket barbecue sauces, which is isn't bad, but it doesn't makes it rise up among a crowded field. You must be doing something right to be in business for 100 years, which is almost how long Kingsford has been producing their signature charcoal briquettes. The company was started in the 1920s by Edward G. Kingsford who utilized the sawdust byproduct from the production of Ford cars to make charcoal briquettes. 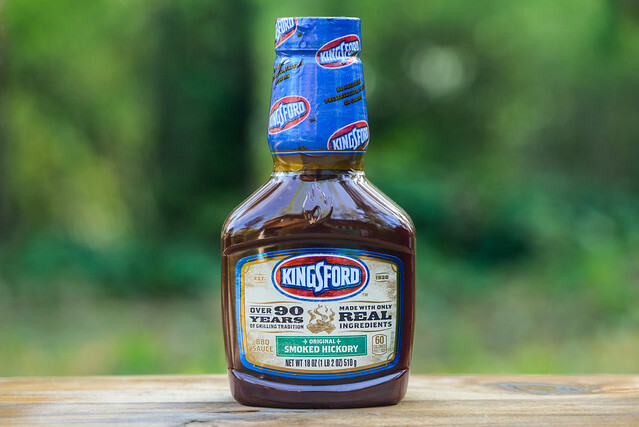 It wasn't until the 1950s though that the company was renamed Kingsford after its founder, and the rest is pretty much history. 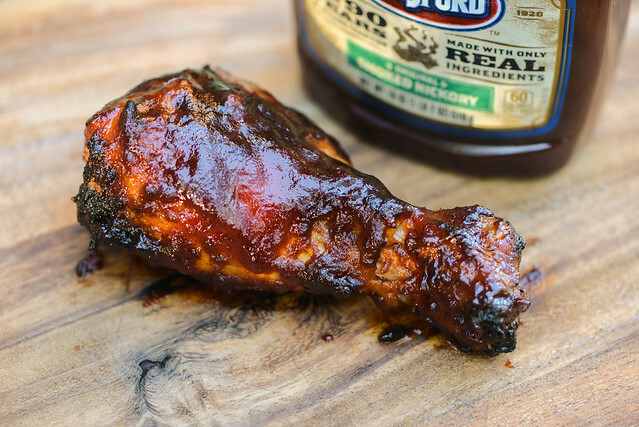 While Kingsford continually tinkers with their charcoal recipe and adds new wood burning products, they've more recently taken the plunge into the world of barbecue sauces, offering three different varieties, along with one barbecue sauce mix, to compliment their briquette business. 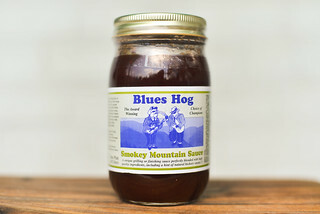 A strong mixture of smoke and molasses fills the nose on first whiff of this sauce. There's an equally strong, acidic tomato base that has an aroma akin to tomato paste. Behind these few dominant traits is a mild vinegar harshness, background oniony notes, and just a hint of heat against the otherwise more sweet smell. This maroon sauce has a semi-glossy sheen and very slight texture to it. It's pretty opaque, making it hard to see any spices save a few specs of black and white here and there. The sauce has a medium-thick consistency that has it falling first in one large glob off a suspended spoon, followed by a few medium-sized drips that cease in a matter of seconds, ending with a medium-thick coating of sauce left clinging to the silverware. 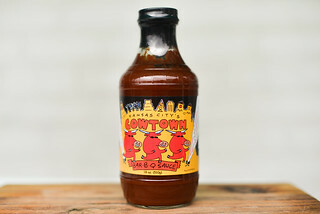 The first taste of this sauce is all sugar, but things quickly change as a strong tomato flavor comes in with a heavy acidity, lending balance to the sweetness. Next, a molasses and smoke combo adds both depth and little pungency right before a wave of vinegar comes in and really amps up the tartness. There's faint tastes of onion and garlic in the background that struggle against the more bold flavors, which gains another component by way of a mild heat that, in the end, leaves a little burn in the mouth to go along with the the smokiness, sweetness, and tartness that continue to persist. This sauce coated the chicken in a medium-thick, uneven layer that only baked down a little over indirect heat. This led to some burn off over direct heat, but the sauce that stayed put gained nice caramelization. The flavor lost some of its harshness as the sweetness ramped up and balanced out the acidity and smokiness better than out of the jar. That smokiness was pretty intense though, venturing into pungent territory. The strong molasses also persisted, which gave the sweet profile a bit of depth beyond sugar alone. I was a bit leery of these Kingsford sauces at first because they all prominently featured smoke on their labels, and despite smoke being the business of Kingsford, too much of it can be a really bad thing for barbecue sauce. I was pleasantly surprised with their Applewood and Mesquite recipes though, which featured smokiness, but in good balance with the other flavors going on. Unfortunately, I didn't feel this Hickory variety kept in line with the rest, falling victim to a usual bold and overstated flavor profile that's common with supermarket sauces. This left the sauce a bit too smoky, acidic, and lacking the more subtle balances that I think define the best sauces out there. Still, in terms of what you can pull off any supermarket shelf, this sauce isn't bad—it just kind of sits in the middle of an already crowded pack. 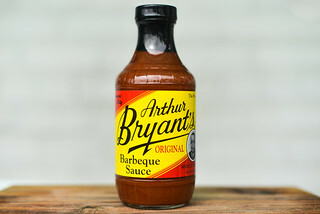 Because of the bold flavors, I thick this sauce is best paired with beef, where the strong beefiness of burgers, steak, and brisket can hold up the intensity of this sauce.